The flier above was delivered to 4000 homes along and close to the St Albans section of The Alban Way during the week beginning 5th October, Whether-or-not you received one, knowing about it could be a good reason to celebrate! The Alban Way is what remains of the Hatfield-St Albans Railway Line. 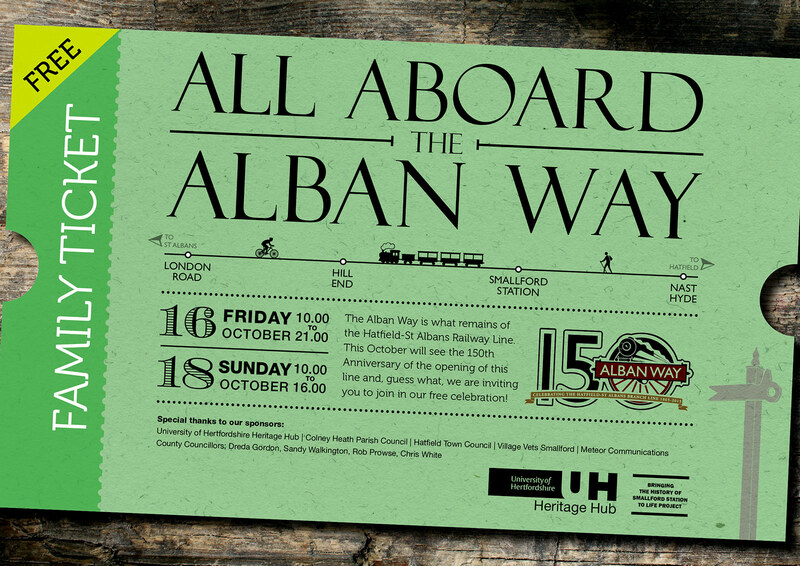 This October will see the 150th Anniversary of the opening of this line and, guess what – we’re planning some celebrations – and you’d be very welcome to join us! Bring a picnic! Enjoy a ‘lunch on the line’! Come and have a bit of serious fun! Nearly all events are free – donations/contributions towards our costs will be most appreciated. Any surplus funds will go towards the Renovation of Smallford Station and the Development of Alban Way: Our ‘Bringing the History of Smallford Station to Life’ Team will be working with St Albans District Council + Oaklands College students and staff to renovate the old platforms, provide historical signage and resting places (benches!) for walkers and cyclists. Thanks in particular to our many supporting organisers and participants: Bringing the History of Smallford Station to Life’ Project Team, UH Heritage Hub, Countryside Management Service, St Albans City & District Council, Welwyn Hatfield Borough Council, Smallford, Sopwell and Ellenbrook Residents Associations, Highfield Park Trust, WelHat Cycling, NLS of Model Engineers, St Albans South Signal Box, St Johns Ambulance, Colney Heath WI, Watercress Wildlife Association, Hertfordshire Archive and Local Studies Centre, St Albans Tourist Information Centre, Chiltern Section Veteran-Cycle Club, Marconi Instruments Heritage Collection, St Albans Movie Makers, Fleetville Primary School: Various entertainers – Harpenden Concert Band, Bishops Hatfield Girls School, Young Miscellany, Katie’s Jumping Fleas Ukulele Band, Christopher Lawley, Chris Flegg and others. Just met and chatted to Mike as he was working on Nast Hyde platform. he put me on to your website. congrats to all who are doing a wonderful job. Will certainly be interested in the walk in October. Well done on the work at Nast Hyde platform. I use the Alban Way regularly for running/cycling and it is an absolute pleasure to see the new additions and it being so well kept. Keep up the good work! I walked along the Nast Hyde stretch for the first time in ages today and would like to thank you for the fantastic work you have done. It looks brilliant. Can’t wait to join the guided walks in October. Can’t manage the full six hours but would love to pick up the walk at Nast Hyde halt if places remain (I live 50 yards away). I run the Alban Way regularly as well as other disused branch lines (Cole Green Way and WGC Greenway). Having met Mike several times I’d like to congratulate him sincerely on his tremendous work. Excellent set of presentations this evening about the history of the station, the line and the area in general. We look forward to future developments.